2017 is a very special year for VMware’s flagship conference. It is the 10th conference taking place in Europe and it is better attended than ever before! The first VMworld Europe took place 2008 in Cannes, France with about 4.500 attendees. Over the years the number of attendees increased continuously. This year more than 11.000 people from 60 countries came to the conference. I am happy and honored that was able to attend all ten conferences. Starting with Cannes, followed by Copenhagen and then for six years in a row here in the beautiful city of Barcelona. When I attend a conference, I always take care not to miss the Keynotes/General Sessions. The big announcements are normally made during these hours and it is a good possibility to start the conference days. Another event I do not want to miss at VMworld is #vBreakfast. Four years ago a friend of mine, Manfred Hofer (vbrain.info) had the idea to bring this VMworld US tradition to Europe. In the beginning, it was not really crowded (only one guest…). But over time, more and more people joined us and so we were able to welcome nearly 40 guests this year! A big “Thank You” to Runecast, who was so kind to pay for our coffee and sandwiches. One reason why I love to attend conferences is the possibility to meet with people. Nowhere else in the world you will find such a high density of virtualization community members. 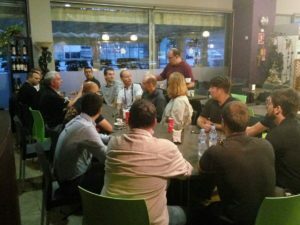 During VMworld, a lot of gatherings and events are taking place where you can easily get in touch with bloggers, specialists from different vendors/partners, and of course with the other attendees. I am really thankful that I was able to meet so many smart people this year again. They are too many to mention, but it is always great to see them again. Every year on Wednesday the big “Customer Appreciation Party” is taking place. The highlight of the party is always a more or less known band. 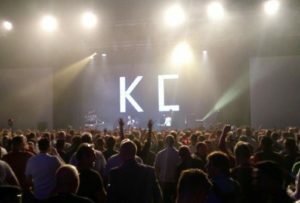 This year “Kaiser Chiefs” was announced as the VMworld Band. I had no expectations as I only knew one of their songs “Ruby”, but now I must say that they were a blast. The atmosphere was really good and everybody had fun! This year the event team made some major changes to the layout of the venue. The most striking change was the relocation of the entrance. Right after the entrance was the Hands-on-lab and the VMvillage area. Both were designed clearly and generously and it was a good place for a break. The only thing I was missing was a higher number of tables with power sockets. All in all the changes to the layout were a big improvement in my opinion. 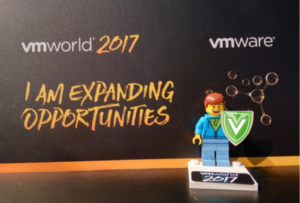 In a nutshell – VMworld 2017 Europe was a blast. A big Thank You to VMware for organizing such a great event – I really appreciated the days here in Barcelona. Unfortunately, time flies by too fast, and so there are a lot of things on my list that I missed to do. By the way, VMworld 2018 will take place again in Barcelona – but later than usual (November).